Archaeological Methods has been designed, developed and authored by a team from the Archaeology Division of the School of Forensic and Investigative Sciences at the University of Central Lancashire (UCLAN) in Preston, UK. The resource hosted on the Universities' web site whilst accessible to anyone appears to be designed to primarily support undergraduate students from UCLAN's Archaeology Division. The programme provides a guide to the Archaeological methods commonly applied to the gathering and recording of archaeological data in the field; from site definition through to the recording of finds and features in excavation and associated survey techniques. Resources for the aspiring archaeological practitioner are not exactly in short supply, either in print or for that matter in electronic format. Entering a search term for a particular archaeological task or operation in any of the available internet search engines will deliver a welter of information about that task/operation, albeit of varying quality, complexity and relevance. Those in the know will of course be able to sort through the material to extract what they need and move on, or else seek advice elsewhere (increasingly and regretfully the use of a traditional Library and the resources on tap from them seems to be in steep decline). However, if you are approaching the whole issue of the application of Archaeological Field Methodologies from a relatively low level of knowledge (typified by the average first year undergraduate), then the contextualisation of all of the typical methods in a concise yet logically progressively and linked manner has to be a boon to the learning process. Probably the best known online resource and certainly the widest in terms of range and detail (to the UK audience at least) is that which was designed to support the print copy of Kevin Greene's, Archaeology: An Introduction (Greene, 2008). Although now into its 5th edition the online support is linked to that for the previous edition and follows the basic structure of the print copy (Available : Greene 2008 [Accessed on 03/10/2011]). The level of detail is good and with a significant number of hot links to case studies and examples it represents a useful and informative entry level guide to the subject of Archaeology – in other words it does what is says on the tin! So what of UCLAN's Archaeological Methods – On line resource? Well to begin with it is not so expansive, which of itself is not necessarily a weakness, and it is specifically focussed to the world of Research and thereby largely excludes some aspects of methodology that might be more apparent in Contract Archaeology scenarios. Similarly it was clearly designed to cover only archaeological methods in the field and relies for the most part on case studies conducted by the academic staff from UCLAN by way of example. The programme employs a wide range of photographic stills, video clips and generally good quality graphics throughout, to better illustrate the methodologies being discussed which on the whole work well although the inclusion of audio is patchy and might have improved some areas, particularly those in covering the surveying tasks (i.e. Walkover survey, Using the Total Station etc.). Some of the video clips included are not entirely successful or particularly focussed, the extended video footage of four field walkers walking in a line runs for over a minute which might convey some of the more mundane and repetitive features of fieldwalking but provides little added value to the written explanation of the process. The opening Navigation page (fig.1) is well designed and intuitive with clickable numbered headings (sections) which essentially flow through a project timeline moving from site definition through to a number of aspects of site recording. The graphic of the Navigation page is refreshingly uncluttered and the eye is readily drawn to the simplified headings which when accessed take you directly to an introductory page in which there is a contents list for the section. Navigation is then consistently paged on subsequent pages by clicking on an arrow located on the bottom right (which allows you to go back a step as appropriate to the section) with a return to the opening Navigation page engaged via a clickable ‘Navigation' button. Moving from section to section and in and out of the embedded graphics works well. Some links are provided to other web pages (highlighted in yellow script) some hosted on the University server and others to external sites all of which worked well and opened as one would expect in new tabs in the users browser. Navigation back to the main Navigation page from these web links is not described in the programme and requires the user closing or minimising the tab which although a standard process in navigating through all browsers might be worth noting in the Instruction section that fronts the programme. Overall the programme is simple to navigate and the reviewer found no problems or glitches in running it through Explorer v.7.0. There is an Introduction section within the opening Navigation page, should it be needed, but the in-built logic and simplicity of the programmes design makes this redundant for most users. A note of caution however on repetition of terminology occurs in the section heading of Defining a site (Section 1) and the sub heading in Surveying a site (Section 2) which is similarly titled Defining the site (2.1) which refer to entirely different tasks. The overall content contained within all of the sections of the programme could best be described as being consistent with that required for an entry level understanding of the subject matter. The organisation and sequence of the information supplied is logical and all of the principal archaeological processes are covered at least in outline. In this respect the programme scores highly as its organisation is sequentially faithful to the process itself and will no doubt help to re-inforce the progressive system of archaeological intervention to the user. Probably the greatest weakness of the programme lies in the depth of content of individual sections. Whilst this was likely to have been a deliberate act of the production team to keep the programme as user friendly as possible it does so at the risk of over simplifying some material. One such section is that of 'Defining a site' which naturally deals with the array of methods within the topics of Desk Based Assessment and Prospection, but one cannot help but feel that the reader is being sold short. The pages on Fieldwalking and Geophysics (fig 2) are both limited in scope and content and give no real indication of the variable techniques that can be employed by both. That there is no detail on the application of these variable techniques is not so much the issue, but a list of variable techniques and methods should have been included with a brief description. Fig 2. 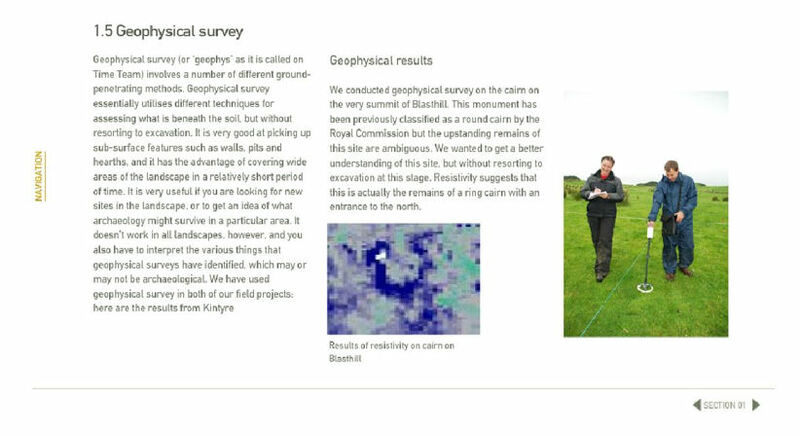 Defining a site – pages on Fieldwalking and Geophysics. The illustration on the Geophysics page (fig 2) might also imply that the Geophysics plot (Resistivity) was produced by the instrument pictured next to it (A Bartington MS2 Magnetic Susceptibility Meter with a Field Coil) which of course it wasn't. Similarly on the Fieldwalking page (Section 1.4) there is no attempt to list the various surveying techniques and one might come away with the idea that Line Walking was the only method available although even it is not mentioned by name. Elsewhere the lack of definition is lesser and the following sections are probably pitched with the relevant level of content for an entry level audience. As one would expect each section is supported by a list of further reading which could be expanded particularly with regard to alternatives to the main texts quoted and references to published supporting case studies (and hot links to associated web pages if available) as relevant. It is when one turns to the excavation process that the programme is perhaps most beneficial. Whilst there is arguably a similar lack of breadth of content regarding variations of types of features and soil types, recording strategies etc., the basic process's are covered quite effectively and for those whom are about to venture out onto their first excavation experience, progressing through Sections 2-11, would put their experience in context irrespective of the project they actually attend. The scope for expanding and building upon these sections particularly with supporting case studies and additional graphics is plain and hopefully will be considered in due course. Whilst the target audience for this website is not actually identified, its location does make that implicit. It no doubt forms a backdrop to UCLAN's lecture programmes and Field School/Training Excavation, and undergraduates would no doubt benefit from it accordingly. As to a wider audience, I would and will happily recommend it to my own undergraduate students as part of their diet in all matters pertaining to Archaeological Practice and therefore it should appeal to any undergraduate at first year level whom needs to get a basic grasp of the field work process in Archaeological Research. Similarly it would also appeal to amateur archaeologists who need a basic introduction to fieldwork but in all cases it needs to be followed up by further reading, which I am sure the development team always intended. The Work Sheets provided in Section 11 are useful additions principally for UCLAN students but could be adjusted and expanded to tailor them to a wider audience. With some notable exceptions in the development of surveying equipment, Archaeological Methods (in the areas covered by this programme) are not subject to rapid change in the short to medium term and therefore maintenance of the programme is mostly about developing content and increasing detail where necessary. The design of the programme would allow for almost endless growth in content without changing the overall layout and concept. Improvement in the production of the video content with greater emphasis on audio content would greatly improve and facilitate the learning process even to the extent that some overdubbing on current footage would be a great improvement.